Normally wolves are secretive and will run away when they encounter people, but they can become habituated and may approach camping areas, and park visitors. Never feed wolves or any other wildlife. Under the Park, Conservancy and Recreation Area Regulation and the Wildlife Amendment Act, it is an offence to feed wildlife. It is extremely important to discourage wolves from approaching. Taking these proactive steps will prevent wolves and people interacting. Keep a clean and orderly camp. Cook and store food away from sleeping areas. Suspend food, toiletries, garbage and other loose objects on a rope between trees, out of reach of wildlife. Securing food and kitchen items is important when the camp is unoccupied, even during the day. Wolves have been reported removing personal and other non-food items from campsites. Keep pets leashed and under control. If possible, keep pets at home. Choose a camp near toilet facilities. Do not camp anywhere near a carcass. Wolves are likely to scavenge on and protect this natural food source. Wash dishes in a container and dispose of grey water deep in a water body away from camp. Do not approach wolves ever. This practice gets wolves used to humans and their scents which results in human habituation. Remember, you are a guest in this environment. This is home to the animals that live here. Begin scare tactic immediately, well before the wolf is within 100 metres. Do not allow the wolf to approach any closer than 100 metres. Raise your arms and wave them in the air to make yourself appear larger. Use noise makers (i.e. air horns), throw sticks, rocks and sand at the wolf, to scare wolves away. When in a group, act in unison to send a clear message to the wolves they are not welcome. If the wolf displays aggressive behaviour, back away slowly, do not turn your back on the wolf. Use pepper spray if you have it and the skills to use it safely. Be aware of the range and operating conditions of the product you are using. While most of the guidelines above apply to wolves in general, please take these specific precautions when recreating in coastal wolf habitat. 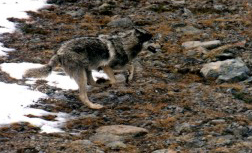 It is common for wolves to feed on carcasses (ie. seal, sea lion etc.) that have washed ashore. To allow natural feeding, BC Parks asks all hikers, campers, and kayakers to avoid camping or recreating in locations where a seal or sea lion carcass has washed ashore. If in a vessel or kayak, do not approach wolves that are foraging along the coastline or swimming across channels. The fact that you are on a vessel or in a kayak will not eliminate the course of habituation. Stay well offshore (200 metres or more) and use binoculars for a closer view. Wash dishes in a container and dispose of grey water at sea, away from your camping area. Use the toilets provided or pack out all of your excrement (wolves have been known to feed on excrement buried in cat holes). Do not clean fish next to your camp; dispose fish carcasses out to sea if possible. Suspend food, toiletries, garbage and other loose objects on a rope between trees, or in food caches where provided, out of reach of wildlife. Do not store food in kayak hatches as wolves have been known to get into hatches to access food. Please see Low Impact Kayak and Canoe Touring Practices for more information.